An article published in the August 2014 issue of Annals of Allergy, Asthma and Immunology, the scientific publication of the American College of Allergy, Asthma and Immunology (ACAAI), outlines the challenges faced by older women in treating asthma, and offers practical solutions to improve their care. The article points out that the asthma rate is no greater in older women than in other segments of the population, but that the amount of illness and death is much higher. The asthma death rate among women older than 65 is nearly four times higher than in other groups. Menopause and Hormone Replacement Therapy (HRT) – The risk for women of developing asthma is not affected by menopause, but, in women with preexisting asthma, menopause tends to increase the number of their attacks. 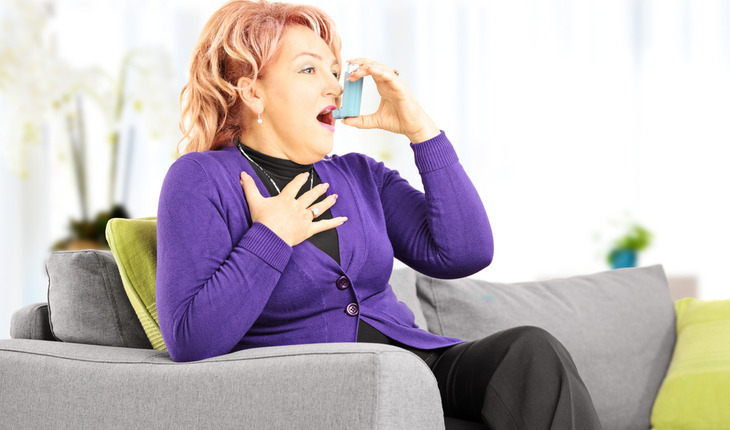 Some studies have shown that postmenopausal women receiving HRT had an increased risk of asthma. At the same time, in women with preexisting asthma, HRT is often associated with improved respiratory symptoms and decreased asthma attacks. Older women with asthma need to consider the potential risks and benefits of HRT. Risk of adverse effects of inhalers – Because postmenopausal women treated for asthma with inhalers (also known as inhaled corticosteroids) have significantly lower bone mineral density, they are at additional risk for osteoporosis. Other effects of inhalers, such as glaucoma, cataracts and adrenal suppression, are also more common in older women and should be evaluated. Incorrect inhaler use is common among elderly patients, but an asthma educator can teach more than 90 percent of older adults how to properly use one. Because inhalers are the best treatment for asthma, ask your allergist about working with an asthma educator. Depression – More severe asthma can cause a greater risk and severity of depression. Women over 65 have been shown to have rates of depression ranging from 15 percent to 35 percent. As treatment of depression among asthma patients shows improved asthma outcomes, women should discuss screening and treatment for depression with their physicians. Perception of Breathlessness – An important tool for preventing the progression of an asthma attack is early intervention and treatment. Since some baby boomers have a diminished awareness of how well or poorly they are breathing, and seem to have a harder time overcoming their perception of breathlessness, self-monitoring with a peak flow meter is strongly recommended during an asthma attack. Additional conditions affecting older women and their management of asthma include being obese or overweight; caregiving roles a woman might have that hamper self-care; and limited income or poverty which can limitability to follow recommended therapies.